Bobbili Raja had been enthusiastically recommended by so many Telugu film fans that while I wasn’t wildly enthused by the plot synopsis, I had to watch it. I think it might be a film best enjoyed with nostalgic fondness for your 10 year old self, but it was entertaining enough and certainly kept my attention. Another Adventure Without Subtitles, I probably made up most of the plot but it isn’t subtle and there is a lot going on so that wasn’t too much of a chore to keep up. The film is loosely divided into three sections. The first bit sets up conflict between power and money hungry Rajeshwari Devi (Vanisri), Minister for Forestry, and rival politician Gummadi and his sister. Rajeshwari plays dirty and when a lackey overhears that the sister Soundarya (?) is pregnant, she tries to shame the family publicly. It emerges that Soundarya is secretly married to Rajeshwari’s brother-in-law (?) and that just makes matters worse. When he comes home, he is somewhat accidentally killed. Then Soundarya is almost raped and bayonets the corrupt policeman assaulting her. She and her brother escape to the jungle where they live in secrecy. The baby Raja (Venkatesh) is born and raised in that distant jungle which can be reached easily by foot unless you prefer to use a helicopter, jeep or bike. Working as a jungle guide, if he works at all, Raja is hired to take the minister’s daughter Rani (Divya Bharti) on a hunting trip. They get separated from her group of squealing girlfriends and following encounters with wildlife, Ooga Booga Central Casting “Natives” and other perils, they fall in love. Rani’s eyes certainly lit up at the sight of Raja handling an enormous snake. But her mother has other notions and separates the lovebirds. So Raja moves to town and sets about getting revenge for his family and getting his girl back. The jungle adventure is heavily influenced by films like Romancing The Stone (think the mudslide with faceplant into the heroine’s crotch. Classy) along with Indiana Jones style adventures (I loved those films when I was young) and a dash of The Gods Must Be Crazy (a franchise I loathed then and now). The humour is hit and miss, sometimes offensive and racist, but Venkatesh is effortlessly likeable despite the material. Raja’s catchphrase is a cheery ‘Aiyo Aiyo Aiyiyooooo’ so there is opportunity for audience participation or perhaps a drinking game. Raja deals with runaway cars (why does his jeep have a kangaroo painted on the door? ), silly women and other forms of recalcitrant fauna and bad guys with aplomb. Venkatesh has a leisurely way of moving, as though he knows the camera will have to wait for him so there is no need to look flustered. This works reasonably well in his fight scenes as they are not particularly realistic and often played for laughs. He does minimal dancing, partly due to the limited choreography, and generally relies on his characterisation rather than say, his burlesque chair dancing skills. Rani is not my favourite filmi heroine but I do think Divya Bharti did quite well with what is often a shrill, silly character. Rani did rise to the occasion when she had to, although I was dismayed when I found myself almost cheering her suicide attempt as at least she did SOMETHING for herself that didn’t just involve shrieking “do you know who I am?” (She had some help from an enthusiastic red paint wielding assistant.) Her outfits were what I have come to expect from 90s Telugu films. But seriously ladies, when your mum asked what teenaged you and your boyfriend/self-declared husband got up to last night would any of you answer like this? Maybe the mini Europe set provided some distraction from difficult questions. But so much of writhing and moaning. Tsk tsk tsk. The mood gets darker once Raja announces himself as Rani’s husband, escalating the conflict with Rajeshwari and co, and Divya does show a different side of her character to match that. She was so very young when she made this. Her performance was quite impressive when you look at the calibre of the rest of the cast and realise she wasn’t overshadowed. Vanisri’s role is the most prominent of the supporting cast, and she is the true villain of the piece. She devises needlessly elaborate schemes and has the men in the family scared witless. I am not sure about the thinking behind her eyeliner technique. Her husband (Kaikala Satyanarayana) is a kindly man, but never directly confronts her so his goodness is moot. He seems to be waiting for Raja to deliver the comeuppance. Kota Srinivasa Rao plays her brother and well, apple…tree… Brahmanandam plays a comedy policeman and Babu Mohan is another comedy bad guy. So much ‘comedy’. There are many things that amused me. I almost look forward to seeing some familiar “faces” in the array of taxidermy but the duck was a surprise. There are lots of scenes with animals, including some comedy elephants. I was concerned about the big cats as they seemed stressed but watching the end credits I was reassured a little that they were still quite feisty. Apart from the animals, the jungle is also inhabited by one or more people obsessed with digging pits and trenches. There are loads of stunts and fights and dramatic incidents as Raja takes on his reluctant mother-in-law and her lackeys. The climax of the film takes place on a hijacked train. Exciting! 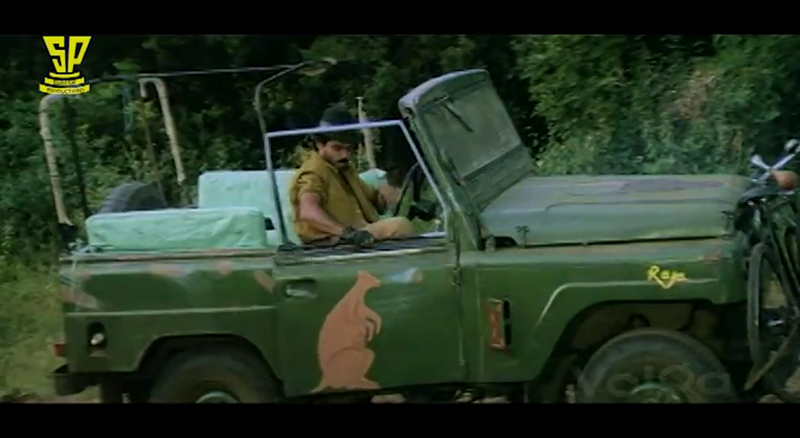 But just in case that isn’t enough, director B Gopal added a lion! And if THAT isn’t enough, snakes! Snakes on a train! It was almost enough to overcome the rather weak (but family friendly) ending. And that approach probably sums up the whole film – throw enough stuff at the audience and they’re bound to like some of it. See this for Venkatesh, the fun if silly songs and the full throttle approach to mass entertainment that just tips the low-gore scale. Suresh Productions has kindly made the film available on YouTube if you’re interested. This entry was posted in Tollywood and tagged Adventures without subtitles, B. Gopal, Bobbili Raja, Divya Bharti, Gummadi, Illaiyaraja, Illayaraja, Kaikala Satyanarayana, Kota Srinivasa Rao, Telugu, Tollywood, Vanisri, Venkatesh. Bookmark the permalink. This was the time of VaniSri come back. (Idk if you know she was early 70s top heroine and this was her come back in ‘aunt’ roles). So, she got to keep her old make-up and have major role in the movies. 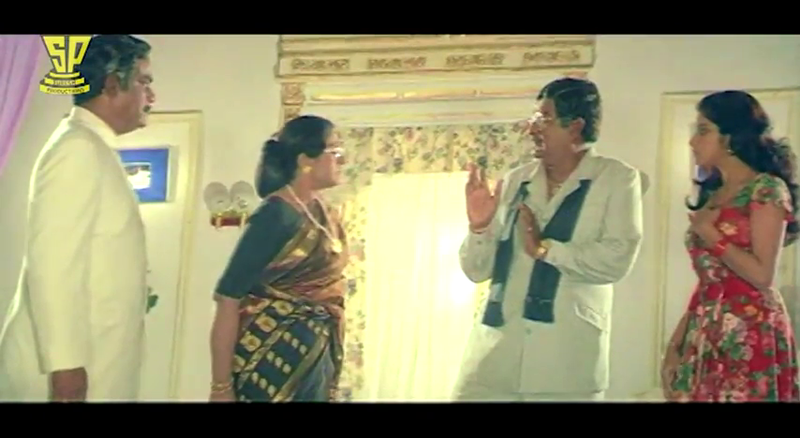 She did this evil “mother-in-law” in lot more movies (“allari-alludu”, “athaku yamudu ammayiki mogudu”). Too sad that Divya Bharathi did have suicide (although controversial) in real life at such an young age. Btw, I guess Venkatesh’s father must be a brother to VaniSri for the cross-cousin marriage to work out among the first cousins as per Andhra culture. I think I’ve only seen Vanisri in her later career phase. It’s always interesting to see at what stage a leading lady hits the aunty wall. Especially in cases when they start playing the mother (or evil MIL) to a former leading man or hero who is actually older than they are. I lost track of some of the relationships in this although I mostly got the older and younger brothers, sisters, son-in-law and parents sorted. My family themed Telugu vocabulary was tested 🙂 And there was never any doubt about who was good and who was a baddie. 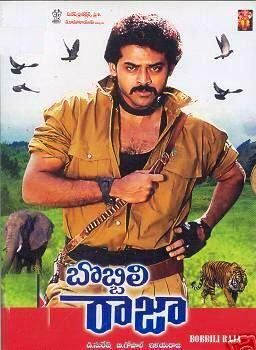 Was the two-toned denim Venkatesh wore also a hit with your contemporaries?